Even by our standards, Sunday’s moving day was a short drive. We departed Aces High RV Park shortly before noon and set out on our short 88 mile drive. Before leaving, we took advantage of our spacious site and short driving distance for the day, and performed a little maintenance on Charlie’s hydraulic system. The hydraulic leveling system on Charlie is a Level Up System by Lippert. Occasionally, these systems can develop a popping noise when the jacks are extended. It sometimes appears to be temperature related, but the problem has become common enough that Lippert has put out a document detailing a fix. View that document here. Essentially they recommend retracting all of the slides and leveling jacks, removing a quart of hydraulic fluid, and replacing the fluid with Fork Oil. Here is an affiliate link the brand we used. 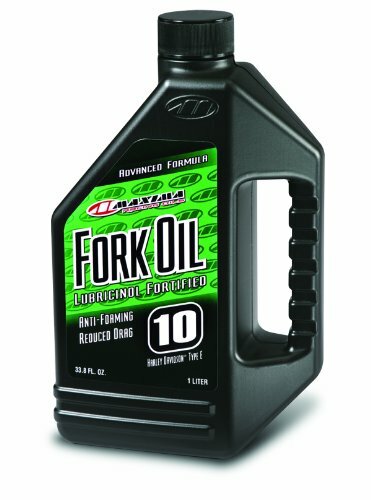 This is not a difficult procedure to complete once you figure out the best way to remove fluid from your reservoir, and the best way to put in the Fork Oil. We completed the task in about 30 minutes and were on our way. After a short, easy drive we arrived at Normandy Farms just as the rain started to fall. Not a serious rain, just enough to make the set up process damp. We settled into our spacious site and spent the rest of the day listening to the pitter patter of rain on Charlie’s roof, but not before we visited Patriot Place for a quick early dinner and to give an appropriate "BOO!" to Tom Brady. Go Eagles, Go Colts, Boo Patriots! Enough about our favorite teams, that complex is impressive, with restaurants, entertainment, retails stores, and even luxury bowling lanes! 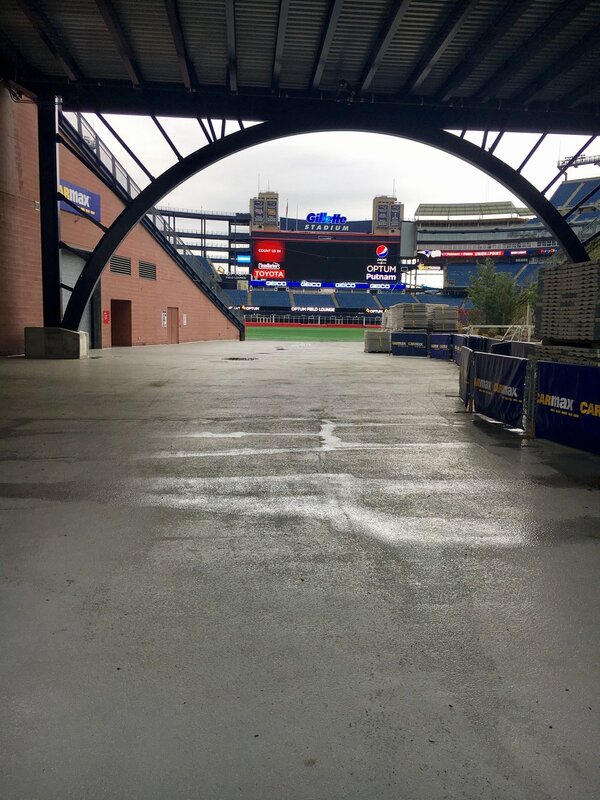 Gillette Stadium looks like it would be a fun place to enjoy a Colts or Eagles game! Oh that's right, we weren't supposed to be talking about our favorite teams, my apologies! Monday morning we had a 9:15 AM appointment at the local Honda dealer to have a couple of things done to Betsy’s Pilot. It was due for an oil change, tire rotation and transmission fluid change. It was an A 13 maintenance for all of you Honda geeks out there! While there, the Pilot brake rotors also needed and got a little attention. Since we stayed at the dealership with the car, we had about four or five hours to work / read in the waiting room. After sitting all morning at the Honda dealer, we were both ready to get outside and do something fun. Once back at the campground, our first activity of choice was disc golf. Now neither of us had ever played disc golf, but we had talked about giving it a try at some point. We had even gotten to the point of looking at buying our own set of discs at a used sporting goods store recently. Fortunately for us, Normandy Farms offers complimentary discs to its guests which you can sign out at the Rec Center. After a quick stop to get our discs, off to the course we went. No warmups were necessary (Maybe we should have! ), we walked right up to the first tee and startup throwing. It took us a couple of holes to get the hang of it, but good or bad we were enjoying a nice walk through the woods with each other on a Tuesday afternoon. Somehow our scores weren’t quite as important, but we kept score anyway because there has to be a winner, right? At least for these two former athletes there needs to be! After 18 holes we were ready to be done, but happy we decided to play a round of disc golf. Plus the 18th hole was literally right behind our camper. Definitely a sport we’ll try again. While returning the discs to the Rec Center, we noticed there were a couple of ping pong tables in the building. We were already warmed up, so we invested 50 cents in the machine to get a ping pong ball and dove into a game. As you can see in the videos below, some games went slow and some went fast, but they were all competitive and fun, so it was all good. Since the day had been full of activities, we decided to relax around our first campfire since embarking on our full-time RV life nearly a year ago. It was sparked (pun intended) by waking up this morning to two bundles of firewood that must have been delivered overnight by the firewood fairy or I guess more likely our friendly neighbor who had already left by the time we woke up in the morning! Regardless, the fire was lovely on a chilly Massachusetts evening and the lattes didn't hurt either! Tuesday was planned as a day to catch up with a friend of Betsy’s who she has known since kindergarten, and two friends / former co-workers from my previous life at Verizon Wireless. We started the morning with a 45 minute drive to Coffeelands in Clinton, MA to meet with Meghan and her son Kaleb. We all got our preferred form of coffee & tea (Kaleb got grape juice) and took a seat in the coffee shop to chat. While Betsy and Meghan caught up, I even found some time to read to Kaleb. He and I both seemed to enjoy the book and it helped keep a three year old occupied while mom chatted with Betsy. Betsy, Meghan and Kaleb rode back to their house and I stayed at the coffee shop to catch up on a blog post or two. After a short time, I picked Betsy up at their house and we were off to our next visit, a lunch with Tricia and Mary. While my last seven years with Verizon Wireless were based in Plymouth Meeting, PA, I had made more than one visit to Westborough, MA for work. Mary was responsible for hiring me into my last job with Verizon, and I hope the Philadelphia Region was happy with her choice. Although I had not worked for Mary directly my last couple of years with the Company, I worked with her on several things and still enjoyed talking with her when I could and respected her work at the Company. Tricia was a peer of mine for almost my entire time in Plymouth Meeting. While she was, and still is, based in Westborough, we had worked together often remotely and occasionally in person. It was fun catching up with them both, hearing a little bit on the happenings at Verizon, but mostly chatting about our new lifestyle and our future adventures. A couple of hours flew by quickly, and I had to remember that Mary and Tricia had to get back to work! How quickly I’ve forgotten about schedules and work commitments. Betsy and I still have commitments and schedules, but definitely nothing like we had in our past lives. We are thankful for the opportunities our new lifestyle have given us. Tuesday was quite a bit of social interaction for these two introverts, but we both completely enjoyed our visits and appreciate them taking the time out of their schedules to meet up with us. These type of opportunities are a benefit of our full time RV lifestyle, and one of the many reasons we love our life!